It's easy to wax poetic when you are leaving a place. You begin to see the beauty in everything without regard for reality. "Wow, look at the way that trash spilled over in an artistic way!" or "I love how that VW Golf is blowing exhaust in my face. It's just so retro." But, as the temperature scales 90 degrees in my classroom and I have 9 kids who want to do anything but what I am trying to get them to do , I'm instantly brought back to reality. Monthly water outages in Vogosca. 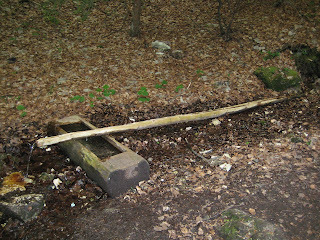 95 degree days, with nary an air conditioner in sight, and the water goes out. For 3 hours. No bathrooms, no drinking water, 150 students. Wouldn't school be canceled at home? And, this is a monthly or so occurrence. Exhaust smoke. Every third car spits copious amounts of exhaust. I'm sure it is a contributing factor to this cough I have had for weeks. Silly Bosnian wives tales. This can be the most humorous and frustrating at times. Just a sampling of the things that many Bosnians still practice (and their doctors are still telling them): 1) Having 2 windows open in a room creates a cross breeze that is unhealthy and will get you sick. This causes many arguments at school and on the buses. 2) Going outside on the day that you wash your hair will get you sick. 3) Wearing shoes that expose the top of your foot before it reaches 90 degrees will get you sick (I've noticed most women wear nylons under their jeans & with heels to prevent this from happening). 4) Immediately after birth, a baby must stay in the house for 40 days. No one should visit and it should not leave for fear of getting sick. Once you do leave the house, the baby must be bundled in double hats, gloves, pants and socks. This will prevent sickness. 5) Pregnancy is to be treated like a disease. Lay down, eat what makes you feel good. 6) Feed your children A LOT of food--skinniness is not good. I wonder if that last one is a hold over from the war, when food was scarce? On an ironic point, Bosnians smoke like chimneys with all windows up. Children, even babies, flail around cars without seatbelts in the front and back seats. Of course this list is biased by my American viewpoints, but that's half the fun. If I had compiled this list in the thick of the winter fog, I probably would have found many more things that I dislike, but the sun is shining today and there are good things to be had in Sarajevo. Yogi Gnomovic--Part Bosnian/Part Japanese, his solar powered mushroom lights the way. Leaving Sarajevo in July will be one of the toughest moves I've done yet. When I left Oregon, I knew the connection would always be there--it's my home. When I left TASIS, I said goodbye to many dear friends and the most beautiful setting on earth, but, everyone was leaving at the same time. We were all transients and somehow that made it easier. 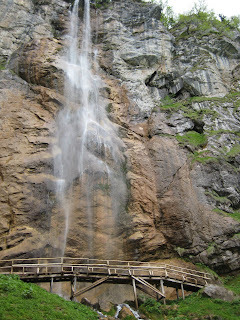 Now, facing leaving Sarajevo in a month is more difficult. 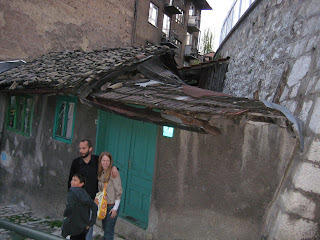 I'm much more attached to the ins and outs of Sarajevo daily life. I'll miss the incredible changing view from my apartment. The easy walk to my pilates classes. A lazy weekend involving no more plans than what I'll cook for dinner. 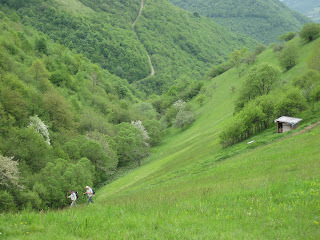 The morning buba commute to Vogosca. Flat bread and Trattoria Uno. The sound of the call to prayer waking me up in the morning. I've even become somewhat of a celebrity in my apartment building. People I've never seen before say hello in English and the children go out of their way to practice their English with me. I guess everyone knows about the American woman living in their building. Just now, a doctor came to my apartment to prescribe medicine for my cough--only 50KM for a house visit? Unheard of anywhere else. Of course, I'll miss my friends and students, too. 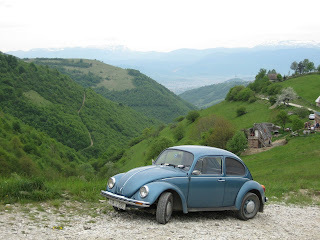 I think the difficulty in saying goodbye to Bosnian friends is compounded by the fact that they aren't able to travel as easily as we can. For the local people who work in international settings, people come and go out of their lives. They remain the same. Change in scenery or work isn't an option. Our friends here have taken us in and made us welcome. They have fed us, made us appointments, translated and interpreted the Bosnian way. Would we be so helpful to a stranger at home? When I told my students this week that I'll be moving to Japan, one of the most heartfelt responses was, "ok, just please don't die in an earthquake over there." Children are so honest. I will be very sad to say goodbye to everyone. It's not as easy this time to just say, "you are always welcome to visit," and leave it at that. I've learned that you can be happy anywhere, you just have to make your happiness. For now, when I think of Japan, all that comes to mind is this video from youtube. 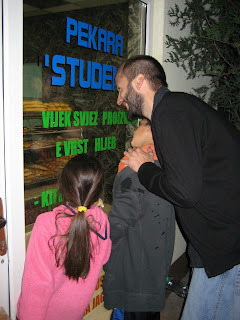 Saturday night in Sarajevo with a 9 year old and 7 year old means a movie, funny pictures and oggling the pastries. check out that roof! Edita kept us company. Sarah is hiding behind me. 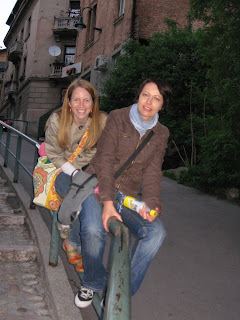 We honored our hard laboring efforts all year long by taking a trip to Croatia for Labor Day (the European one, anyway. Can we celebrate Labor Day in America, too?). After 6 hours of Buba driving, we arrived at Podstrana, a quiet little town 10 minutes south of Split. Our apartment was on the rocky beach and the sun shone all weekend. Cory and Edita are perfectly modeling what we did for 4 days---a lot of nothing. These palm trees in the garden of our apartment are 55 years old! The whole garden smelled of freesia and was overgrown with tropical flowers. 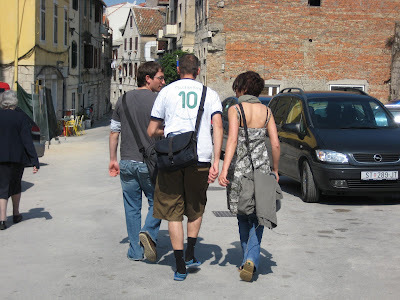 Cory, James and Edita in Split. James sporting his best tourist get-up on the Riva in Split. Those palm trees are incredible. 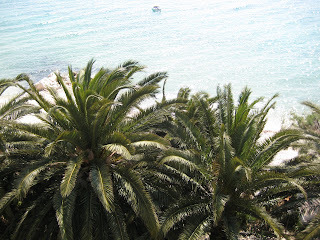 Split has become a huge Croatian destination. It's also a port stop for many cruises--another reason to spend more time at our apartment and less in the city. A very telling picture of the scene in Split--no longer a hidden gem. 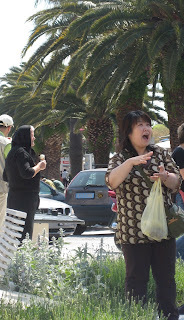 The old lady licking her ice cream cone amongst groups of tourists was great. 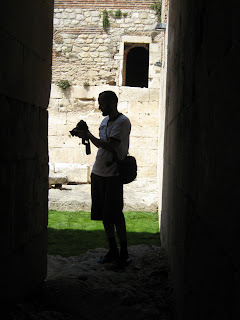 Diocletian's Palace in Split wasn't much to see, but good for a picture or two. Most of it now holds stalls for souvenirs. 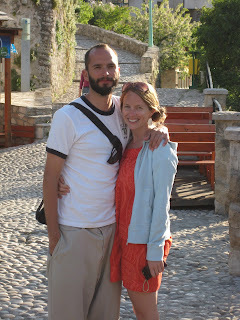 We stopped in Mostar, BiH for lunch on our way home. 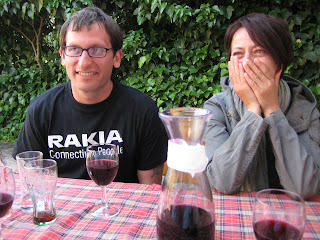 Cory's t-shirt is a take on the Nokia advert--Rakija is a local brandy made from fruit. And it doesn't taste fruity, more like gasoline. 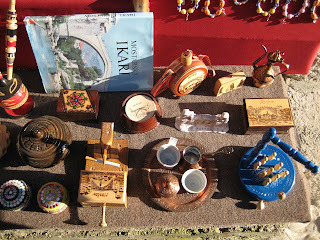 Trinkets for sale in Mostar. I bought a new Tito magnet--we bought one the last time we came to visit, but gave it to our pansion host, Marijiana, who kissed it and put it her pocket. 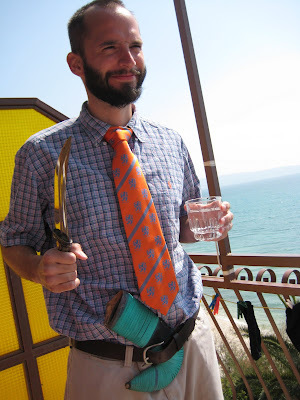 Dirck--you recognize the handmade one-of-a-kind cigarette holder?